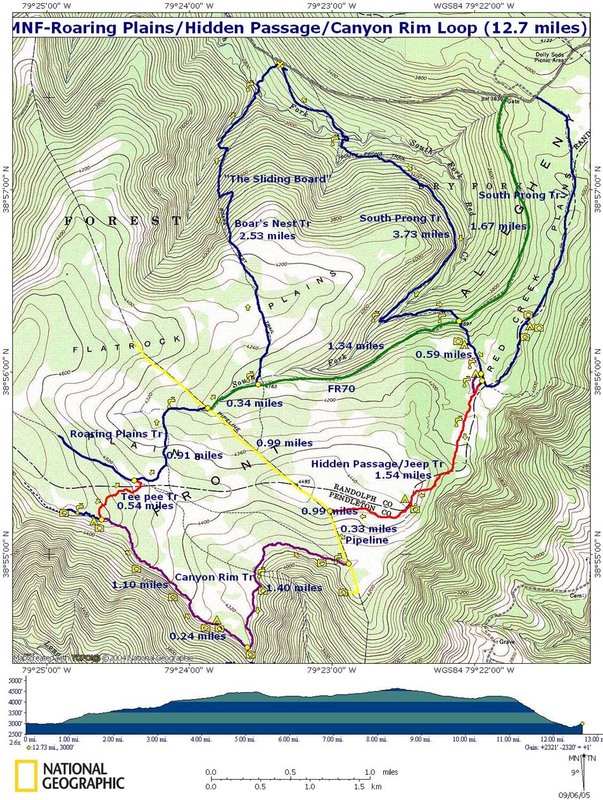 The FR-70 Trail at the Roaring Plains Wilderness in Randolph County, West Virginia is an easy 6.8 mile out-and-back hike that leads into the heart of Roaring Plains and the Roaring Plains Trail. The trailhead starts at the gate on FR-70 with a small parking lot located in front of the gate where you can fit about 3 or 4 cars. The trail runs along a small, likely man-made water runoff, with large rhododendron and mountain laurels spanning the whole trail. Also note that this trail is open to motor vehicles between October to February 28th each year. The trail has a gradual ascend to the end where you'll reach a pipeline and the trailhead for the Roaring Plains Trail; however, you'll pass a couple of trails along the way too. First, you'll pass the South Prong Trail about 1.6 miles in. Next, you'll pass the Boar's Nest Trail, about 3 miles in, where you'll find a small campsite just after the Boar's Nest trailhead. If you're looking to reach the Roaring Plains Trail, take a right-hand turn at the end of FR-70 (where there's another yellow gate) and hike until you see the wooden Roaring Plains Wilderness sign labeling the Roaring Plains Trail. Campsites: The first campsite you'll find, during the Summer, is located at the Boar's Nest Trailhead around mile 3. There were a couple of small offshoot trails which may have had campsites in them as well, but we didn't check. You'll also find a 2nd campsite just beyond the Boar's Nest Trail, just a couple hundred feet down the trail. Wildflowers: During the late Spring and early Summer, this trail is littered with a plethora of different wildflowers. The rhododendron and mountain laurel tend to be in bloom around this time of year as well.